The Recipe drops the world’s first ‘360 rap video’ for their No.1 single ‘Death to Get Here’. Shot by CollectiveBKP using interactive 360 technology, The Recipe takes you on a dark journey of the sacrifices they made for hiphop. Best viewed on the mobile YouTube app for the full 360 effect, ‘Death to get Here’ drops plenty of metaphorical references to the current state of hiphop as well as the groups constant personal struggles to ‘make it’ in an oversaturated and cliche market. Produced by upcoming Dubai producer @Bangzymusic, ‘Death to Get Here’ recently hit No. 1 on the iTunes UAE charts and follows The Recipes signature sound of balancing raw hiphop with the sounds of today. The Recipe began as a project designed to bring talented Hip Hop artists in Dubai (United Arab Emirates) together to record a compilation album and help promote the culture in the Middle East, as the project grew and began generating regional interest, the collective began receiving invites to perform at live events. 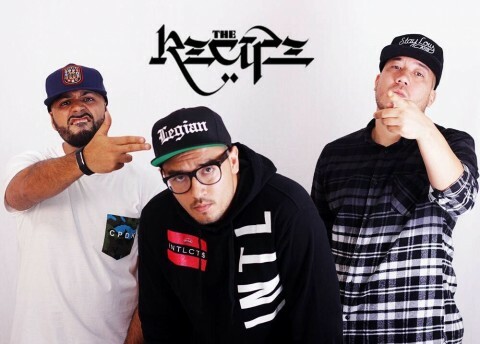 Upon completion of the mixtape the collective launched the project under the name “The Recipe” with a sold out event,making it the first Hip Hop show headlined by regional artists! The Recipe have performed at clubs, art shows, exhibitions, festivals, charity gigs and concerts, either as the main act or in support of international artists such as Macklemore and Ryan Lewis, Rick Ross, Snoop Dogg, Fat Boy Slim, Akon, Fat Joe, 50 Cent, Lloyd Banks, De La Soul, Marcus Houston, Omarion, Lloyd, Prime Cuts, Foreign Beggars, Pendulum and Karl Wolf. Previous Happy Music – A New Healer?